If you follow me on Instagram you might have spotted us at the opening of the brand new Bracknell M&S store last Thursday. It was very busy, with crowds gathering long before the official 10am ribbon cutting with the mayor. 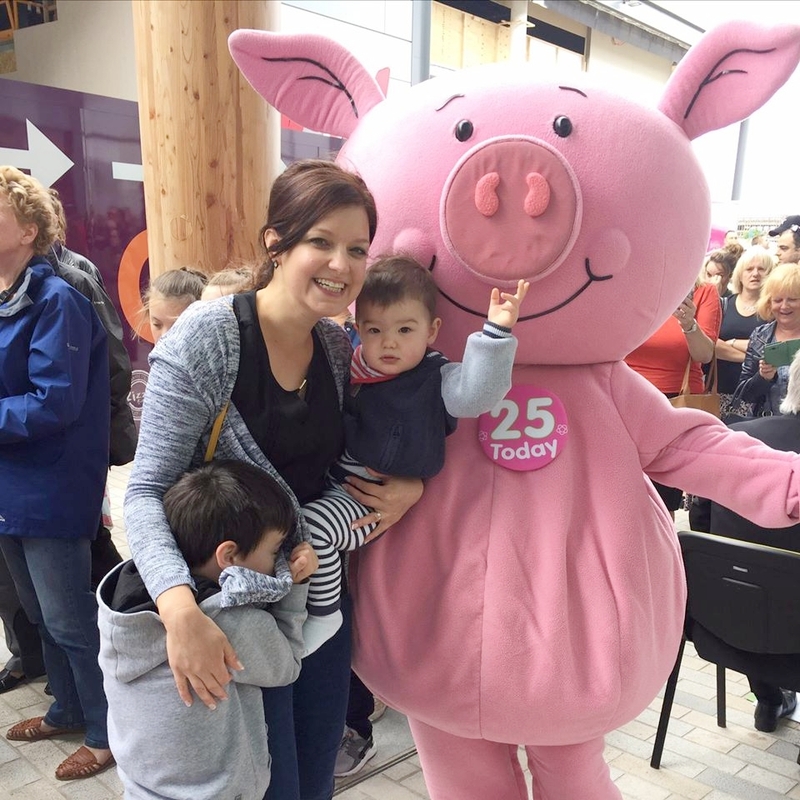 We enjoyed prosecco on arrival, and met Percy Pig who is celebrating his 25th birthday this year. 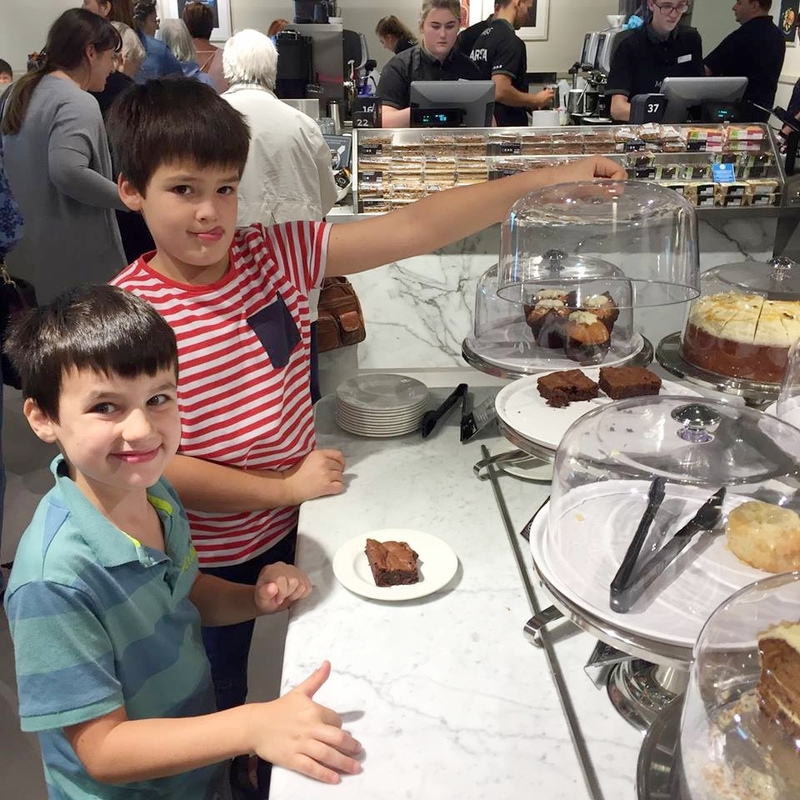 After a tour of the fabulous new store we enjoyed toasties, tea and cake in the cafe. It's bright, airy and spacious with cheerful staff and a broad selection of delicious cakes. Finally, we visited the Foodhall which has thousands of inspiring food and drink products on offer - perfect for alfresco dining or a seasonal weekend treat. It also boasts an in-store bakery with a display of tempting freshly baked specialty breads, pastries and cakes. 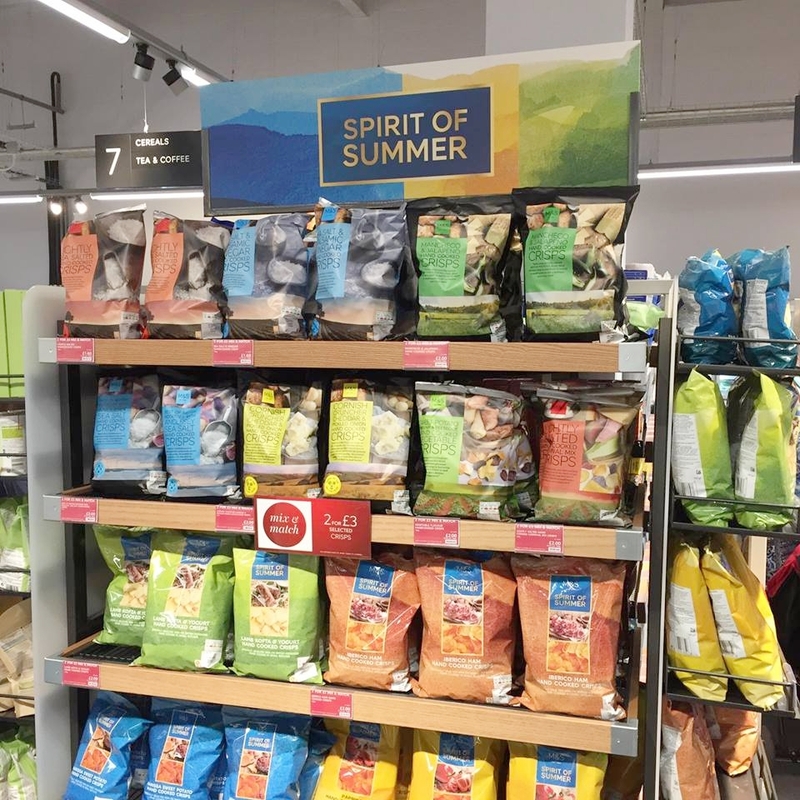 The Foodhall in Bracknell also showcases M&S’s new 'Spirit of Summer' range - food and drink inspired by aromatic flavours of the Mediterranean. The range includes a show-stopping collection of slow cooked meats, spicy dressings, moreish salads and easy-to-use cooking kits - perfect for a summer BBQ or picnic menu to impress. I had a hankering for Spanish food, so picked up a patatas bravas kit, some ready-made churros, a bag of Iberico ham hand-cooked crisps, and a bottle of non-alcoholic sangreia-inspired spritzer. The plan was to make a two-course meal for a 'date night in' with the hubby - something delicious and special that required little time and effort. The patatas bravas kit came with a sachet of seasoning, a jar of spicy 'bravas' tomato sauce and a jar of alioli. I have made patatas bravas from scratch before and very much enjoyed it, but it does take a bit of time. The kit could not be more straightforward - coat potatoes with oil, season and bake, then top with the tomato sauce (warmed) and alioli. A garnish of fresh parsley is optional. The kit serves 2. I decided to make my kit into more of a meal by adding four skinless chicken thigh fillets (it's the tastiest part of the chicken for sure!) I also cut a red onion into wedges and threw that into the mix. I gave everything a good rub all over with oil as directed in an ovenproof dish (to minimise washing up). I was concerned the seasoning wouldn't stretch to cover the extra ingredients but there was plenty. It was ready after baking for 35 minutes in a pre-heated oven at 180 C fan (the box said 30 minutes but I think my potatoes were cut a little on the large side). I could have easily served it in the oven dish (to further reduce washing up) but I wanted to make it look pretty, so arranged it into a serving dish before spooning over the spicy tomato sauce (warmed up) followed by the alioli and a good handful of flat leaf parsley. It tasted as magnificent as it looked! I knocked up a little side dish for my 'pollo y patatas bravas' main - some fresh green beans en papillote with a Spanish feel. I lined a small ovenproof dish with a (previously scrunched up) rectangle of baking paper big enough to generously wrap up the beans. The beans were placed on top along with a finely diced ripe tomato, a crushed clove of garlic, a glug of olive oil, the juice of about half a lemon (or to taste - I like lots of lemon) and some salt and pepper. I tossed the ingredients together before sealing up the paper and popping the dish in the oven alongside the pollo y patatas. I cooked the beans this way because a) I could put them in the oven and forget about them until everything was ready instead of standing and stirring at the hob, b) wrapping them up steams them rather than roasts them so they don't shrivel up, c) it saved me washing up a saucepan pan and d) because they look pretty. I topped the cooked beans with some toasted flaked almonds (I used the same pan to warm the bravas sauce afterwards to minimise washing up, so I was still winning on that front). Served with an extra squeeze of lemon, they tasted incredible. To drink, I served the sangria inspired spritzer over lots of crushed ice with some mint leaves and slices of mandarin and lime. It was so refreshing and fruity, but not overly sweet with flavours of blood orange and grape. As much as I love a glass of wine, it makes me so sleepy in the evenings after a day chasing small boys in the summer holidays! The spritzer went well with the food and it would also be great for a BBQ. The ready made churros required only 7 minutes in the oven to warm up before sprinkling with cinnamon sugar to serve. That was more than enough time for me to warm up the chocolate sauce in the microwave and stir through a little mandarin zest. The zest added a lovely fresh citrus note - not that the rich, dark chocolatey sauce needed anything! Served with some juicy fresh dark cherries on the side the combination of flavours was immense. Such a lovely and unusual dessert that looked beautiful and took minutes to make. I also have to give my Iberico ham hand cooked crisps a mention as well. I'm not big on crisps, but I really enjoyed them - the flavour was spot on. I actually used some of the alioli from the patatas bravas kit as a little dip for them, as there was quite a lot in the jar. It took crisps and dip to another level, especially with a glass of the lovely cold sangria spritzer. Got us feeling super summery! We really enjoyed our two-course Spanish inspired 'date night in' meal with the lovely M&S Spirit of Summer bits. It took no time to prepare, tasted absolutely delicious and it was unique and unusual. It was cheaper, healthier and far tastier (in my opinion) than a take away. I'd be tempted to use the range for entertaining and alfresco dining. I'll be back to sample some more things soon - the tagine kit is next on my list to try! Disclaimer: this is a sponsored post in association with Marks & Spencer. All words, opinions and images are my own.